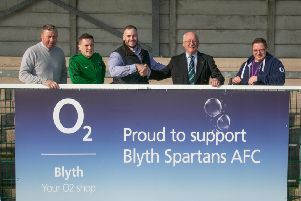 Dan Wilson notched a first-half hat-trick inside nine minutes for Blyth AFC who began life in the first division of the Northern League with a 4-3 victory over hosts Ashington at a sun-drenched Woodhorn Lane on Saturday. Potentially, these clubs could meet on another two occasions in cup competitions over the next few weeks – and if that were to come to fruition, the marker has been well and truly put down by this thriller. Certainly this contest had just about everything – and it all began after only 80 seconds. Home debutant Zak Atkinson got the better of ex-Ashington’s Kyle Oliver and, after advancing into the box, Atkinson was sent tumbling to the ground by the defender. Gateshead-based referee Stephen Dial awarded the spot-kick but Kyle Downey’s low-struck penalty to the right of Chris Bannon, saw the keeper make a fine save. What a game changer that proved to be as the Colliers – who bossed the opening exchanges – suddenly found themselves a goal behind after 14 minutes. A superb diagonal ball from the right by Craig McFarlane found Bobby Taylor in acres of space and the winger applied a cool finish, lobbing over Conor Grant as the keeper advanced. The score came against the run of play – but little did the home side know what lay around the corner as shortly afterwards and in a remarkable transformation, Wilson plundered a hat-trick with expert finishing to send The Braves into a 4-0 lead by the half-hour mark. In the 21st minute, Ashington lost possession in their own half and when the ball was played through by Taylor, Grant did extremely well to deny David Robinson. However, the rebound fell straight into the path of Wilson who made no mistake with his right foot. Wilson nodded another opportunity over the bar but got his second when Taylor’s cross was played back into the middle by Dylan Williamson and the centre-forward hooked the ball home. With Blyth now looking like scoring every time they went forward, goal number four arrived when Taylor supplied the cross for Wilson to tap in with ease and duly complete his treble. On 50 minutes, Ashington boss Steve Bowey made a double change – withdrawing Lee McAndrew and Kyle Downey and introducing Damien Stevens and Jake Turnbull – and the move paid rich dividends. Three minutes later, Stevens set up Gerard Richardson who steered the all home left-footed then after Wilson had dragged a right-footer wide, it was pace coupled with determination by Stevens which caused panic in the Blyth defence. Grant’s long clearance saw the striker win the race with McFarlane before the ex-Whitley Bay and North Shields defender hauled Stevens down and referee Dial again had no hesitation in pointing to the spot. Stevens took the kick himself and calmly placed the penalty inside the corner, even though Bannon dived the right way. A right-wing cross by Ben Christensen saw some great defending by the Blyth rearguard. With 20 minutes remaining, the lively Atkinson flicked on from Grant for Stevens, whose sweetly struck half-volley was well taken by Bannon. Ashington attacked again and Bowey – on for the injured Matty Wade – found Jay Hornsby on the left and his cross was headed wide by Atkinson. Blyth had a chance on 83 minutes but when the ball was played across the area from the right, Taylor miscued his effort. Amazingly, in the last minute of the 90, Ashington pulled the score back to 4-3 to set up a grandstand finish when Bowey directed a corner to the near post, where Richardson netted with a bullet header. Seconds later, Blyth’s Adam Forster had an opportunity to put the game to bed but sent a curling effort just wide before referee Dial brought what had been a pulsating encounter to an end. *On Saturday (August 11), Ashington are at home to Knaresborough Town in the extra preliminary round of the Emirates FA Cup (3pm), then the Colliers make the short journey on Wednesday (August 15) to face North Shields. If the Knaresborough game requires a replay it will be staged on Tuesday (August 14) at 7.45pm and take priority over the match with North Shields. Ashington: Grant, McAndrew (Stevens 50 minutes), Hornsby, Bell, Christensen, Vipond, Downey (Turnbull 50 minutes), Henderson, Atkinson, Wade (Bowey 69 minutes), Richardson. Subs not used: North, Armstrong. Blyth AFC: Bannon, McFarlane, Walker, Forster, Coppen, Oliver (Rundle 69 minutes), Taylor, Gillesphey, Wilson (Hudson 76 minutes), Robinson, Williamson (McRoberts 72 minutes). Subs not used: Chilton, Fenton.